Before architecture, there is the maggot. Let us begin with a dictionary, which will tell us as much. The Oxford English Dictionary (online edition) defines “maggot” as “a soft-bodied apodous larva, esp. of a housefly, blowfly, or other dipteran fly, typically found in organic matter and formerly supposed to be generated by decay.” A worm is a worm by any other name, and so the OED continues with alternative definitions for the term. A maggot can be a parasitic personality, a worm-like person. As Walter Bagehot would put it in 1865, “Reviewers are … a species of maggots, inferior to bookworms, living on the delicious brains of real genius.” The word, usually reserved to describe a small, slimy whitish annelid feasting on rotting flesh, can also mean a bad or harebrained idea. As one character declares to another in Georgette Heyer’s Sylvester (1957): “you’ve got a maggot in your Idea-pot.” Maggots, whether real or imagined, are just plain gross. A large corner building on the main street had been condemned and had to be blown up. The boss of the gang in charge went for instructions to the city engineer. He ran him to earth after prolonged search in a combination of drinking-hole and house of ill-fame. He was up to his neck in absinthe, which is not really a wholesome drink in that climate; but he was able to talk and readily agreed to calculate the charge of dynamite required for the house breaking. He took a stub of pencil and worked it out on the marble slab of his table. Strange as it may seem, he shifted a decimal point two place to the right without adequate excuse --- unless we accept the absinthe as an apology. The boss went off with his figures and put in a charge just a hundred times too big. The whole block was completely wrecked; and they were still clearing the street when we arrived. Here’s an earworm for you. It’s a catchy story you may even recognize. There’s even architecture! A young girl wanders in a darkening wood. She is eventually lost and finds a house in the murk. An older woman lives there and provides the young girl with warm food and soft bedding. Everything seems alright. Then the young girl notices strange things. She can hear furtive whisperings through the walls. She becomes prone to acts of irrationality, and in one instance, even feels overwhelmed by the house. One night, she faints. But everything there is not what it seems. It is the stuff of fairly tales—abductions in the dark, thick tangles of menacing forest, houses full of secrets. Hold on to that thought, it’ll come up when you least expect it. [T]hey utter their pleasure not by sounds that perish, or by words that go astray, but by signs in heaven, by changes on earth, by pulses in secret rivers, heraldries painted on darkness, and hieroglyphics written on the tablets of the brain. They wheeled in mazes; I spelled the steps. They telegraphed from afar; I read the signals. They conspired together; and on the mirrors of darkness my eye traced the plots. Theirs were the symbols; mine are the words. Of the three sisters, there is one whom De Quincey identifies as the “mother of lunacies, and the suggestress of suicides.” She is Mater Suspirorium, or Our Lady of Sighs, an apparition known by her audible, exasperated, and maddening sighs. Mater Suspirorium was also the inspiration for Dario Argento’s cult horror film Suspiria (1977). Argento’s film tells the tale of a young American dancer Suzy Bannion (Jessica Harper) who arrives in Germany to attend a mysterious dance academy in the middle of the Black Forest. Young girl. Dark wood. Strange buildings. Nurseries. Familiar? Well, sort of. Except that there is a lot more going on, architecture-wise. Let us mull over the opening shot of the film. The camera trains on the arrivals/departure board. It pans downward to reveal Suzy, wearing a white dress, walking past the baggage claim on her way to a taxi stand. It is a scene of interminable activity. Harried businessmen hurry in-between Plexiglas partitions bearing ads for cigarettes and tourist destinations in Germany. Suzy seems a bit confused, as if drawn against her will through this throng of people and oppressive spaces. Lest one think that this is generic airport architecture, think again. Argento filmed this sequence inside Ernst Sagebiel’s Flughafen München-Riem (1939). Formerly an employee of Erich Mendelsohn’s, Sagebiel is known for his aviation-related works such as the Reichsluftfahrtministerium and the terminal and layout for Flughafen Berlin-Templehof. Although not as well known as these, Sagebiel’s terminal at Riem was Munich’s main international airline gateway until 1990. The terminal space that Suzy is walking through remained unchanged by the time Argento filmed Suspiria, the main difference being that the sets of glazed doors at the front have been replaced by sliding glass panels. They slice through the space like pressurized guillotines. Strange architectural delights abound in Suspiria. For the Tanzakademie—the creepy dance school that Suzy enrolls in upon arriving in Germany—Argento uses the blood-red façades of Jakob Villinger’s Haus zum Walfisch (House of the Whale), built between 1514 and 1516. The dance academy is, of course, the De Quinceian nursery, a place for education and terror. A scene where Suzy goes swimming takes place inside the Müllersche Volksbad (Müller Public Baths) in Munich, an example of Jugendstil architecture designed by Karl Hocheder in 1901. Some well-known buildings and grounds are even used to eerie effect in Suspiria. A German shepherd mutilates his blind owner on the grounds of Munich’s Königsplatz, once a site of massive Nazi rallies. 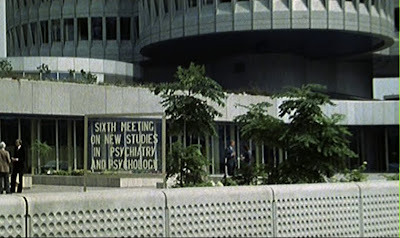 Even more strange is a brief cameo by Karl Schwanzer’s BMW-Vierzylinder (1972), the familiar cylinder-shaped skyscraper (reminiscent of John Portman’s Bonaventure Hotel in Los Angeles) here staged by Argento as a psychiatric institute. These buildings, as visually compelling as they are, are literal stage settings. Argento frames these buildings very carefully to manipulate Suspiria’s atmospherics. Through surprising smash cuts and the use of blue and red lighting, he transforms familiar buildings into oppressive structures. Much needs to be said about the interior architecture in Suspiria. The production and art design by Giuseppe Bassan, Davide Bassan, and Maurizio Garrone takes an obvious cue from early twentieth-century decorative arts. Reflective floral patterns, gaudy geometric wallpapers, gilded, swirling balustrades—call it Art Deco on Acid. And don’t forget the famous double murder that happens as soon as Suzy arrives at the Tanzakademie. It begins with a demon stabbing a student’s exposed heart repeatedly. But the first murder involves architecture, or more specifically, glazing. 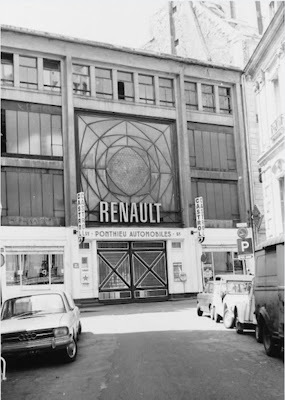 The same demons not only runs another student’s head through a glass pane, but also garrotes her with a telephone cord and pushes her body through a glass ceiling detail that is not unlike a Technicolor version of the ocular glazed façade to Auguste Perret’s Garage Ponthieu (1905). Yet the strangest architectural event from Suspiria brings us back full circle to the idea that introduced this piece. In one scene, we see Suzy in front of a bedroom mirror, staring at her own image while slowly running her hands through her hair. She stops and picks something from her comb—a tiny, white maggot. Cut to one of the Tanzakademie hallways, where pajama-clad girls are running underneath falling worms. As one student looks up to the wooden ceiling, the camera pans and follows her gaze, thus confirming our worst fear: architecture dissolving under the whitish maw of a maggot rain. I meant to let you know how COMPLETELY UNSETTLING this piece was. I read this on transit and felt quite strange doing so - I felt like I was watching a snuff film in public. Your description of the glazing-murder reminds me of the horrible death of Ola Brunkert. I guess I have no choice but to track down Suspiria now - I enjoy horror films but it still may take me a while to work up to watching it after the picture you've painted here. Hi Greg ... I was trying to capture some of the Suspiria's atmospherics in the piece. And though the piece is unsettling, there's lots in the film that even more so. I saw the film last summer during a nasty bout of insomnia ... and let's just say that it did not help the situation. That being said, I think that Suspiria is actually a great film ... let me know what you think about it. I think it'll surprise you.